Do you ever wonder what happened to America? Do you wonder how we went from a stable, prosperous land in the 1950s — a land whose cities were the jewels of the world with neighborhoods where no one locked their doors and an education system that was second-to-none — to a country where it isn’t safe to walk the streets at night, and where huge numbers of people graduate high school unable to read, but fully convinced that White heterosexual men (particularly those of the working class) are StupidEvilRacistSexistNazisWhoWannaKillSixMillionJews? Do you wonder where strident feminism came from? How about the “trans-gender” agenda? Do you wonder who’s behind the rise of militant black racism or open borders? Or why radical red guard-style communists, masquerading as “anti-fascists”, are free to roam our streets attacking any White person, they deem “racist”, or “sexist”, or “homophobic”, etc., with relative impunity? In short, have you wondered how we lost America? In January of this year, Tom Kawczynski found himself at the epicenter of a manufactured national media firestorm designed to force him out of his position as the town manager of Jackman, a small community in rural northern Maine, for daring to ask these questions. Jackman’s loss was America’s gain. His forced resignation gave him the time to answer these questions and more. My parents taught me to be honest, and always strive for the truth to the very best of my ability and without fear for the consequences. I’ve written this book with this understanding. My hope is that it will serve as a beacon for others in their own search and help those out there to understand both my own efforts and those of many others who are branded as evil and wicked by the lying media. While acknowledging that “History is messy because there are many contradictory actors and agendas all at work” and stating that he’s “not going to try to offer . 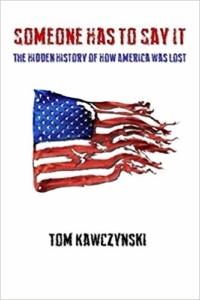 . . a narrative that removes that ambiguity,” Kawczynski argues against the “accidental” view of history that most of us accept (because it is presented as fact by establishment historians and promulgated by the mass media) and presents a strong case for what he calls the “conspiratorial” view. He then goes on to demonstrate the comprehensiveness of Jewish involvement in everything antithetical to the interests of White America and suggests “we should ask why we keep finding them far more than any natural distribution whenever efforts are made to undo our society.” He recounts this Jewish involvement in dozens of issues, great and small, recognizing, for instance, that the Rosenbergs (who sold atomic secrets to the Soviets) were Jews. He notes that “It would have been interesting to hear Oswald’s defense, but he was murdered just two days later by Jack Ruby, a man born Jacob Rubenstein in Chicago and who ran a night club in Texas”; and he comments on “how heavily involved [Jews] were with the creation of the Soviet Union,” not to mention international communism, in general. He goes far beyond merely blaming Jews, however, and makes the case that the beliefs and actions of Whites are a big part of the problem by presenting a panoply of players — from feminist activists to corporatist stooges — and showing how, under the influence of Jewish hegemony, their collaboration enables the destruction of Western nations. it’s interesting the most valuable assets of the American fleet, the aircraft carriers were all safely away from Oahu. For all the code breaking prowess of the United States, and their own war planning conducted by General Mitchell, they had thought Japan might one day try a first strike attack, but security was strangely lax. Rumors persist to this day the British knew the attack was coming, but the prize of seeing the sleeping giant that was American mobilization brought into the war [was motivation enough]. A major platform of this new globalism is the destruction of local communities, both via demographic change and through economic ruin — a phenomenon Kawcyznski is intimately acquainted with because of his role as town manager. According to Kawczynski, the federal government destroys “the ability of the local community to sustain itself. Sucking all the oxygen out of the room with the massive taxes they collect at the federal level and the administrative mandates which every town, city, and state struggles to comply with.” Hyper-taxation at the federal level steals funds from local governments which the feds then give back, but with restrictions. These restrictions come in the form of mandates which allow the federal government to circumvent Constitutional limitations on federal power. For instance, the Constitution makes it clear that education is a local concern and the federal government has no say. But by taking our taxes away from us and then giving them back, they can demand that local communities comply with federal rules on education. In his chapter on “The War of the Sexes”, Kawczynski briefly touches upon many of the profound problems of feminism, including the negative economic impact of feminism, which is only rarely discussed. He points out that “where the old system had one person, almost always the man working to make enough money to sustain his wife and family, this new system would have two parents working, each making less as the labor supply swelled with wages dropping accordingly.” Flooding the labor-pool with women reduced wages, making it difficult for most men to earn enough money to support a family, this, combined with racial-flooding, has led to a situation in which — after accounting for inflation — the average man in America now makes less than 60% of what he made in 1971. It’s certain true that the fix will not be quick or easy, but it is remarkably simple: just eliminate incentives and subsidies for anti-White groups and re-enable White men to express themselves in a manner that is healthy and natural. In practice this means eliminating all of the various forms of welfare for anti-Whites, including “Affirmative Action,” and allowing White men to think, speak, and behave in ways that are natural for them. Although long-time readers of The Occidental Observer and other veterans of our struggle will already be familiar with much of the material in the book, there are several informative chapters on topics generally considered side-issues that are nevertheless important to our movement. This reviewer particularly liked Chapter 21 on the Internet, Chapter 23 on climate change, and Chapter 24 on junk food. Further, because of it’s gentle approach to the Jewish Question, it is an excellent introduction for people less informed; Kawczynski’s approach is unique in that it is suitable as a primer for newbies from both ends of the political spectrum. It explains effectively to those concerned with gun rights and the Muslim Invasion why these things are happening while at the same time demonstrating to “progressives” why they are part of the elitist globalization problem — not the solution. Someone Has to Say It makes an excellent gift for friends and family members who could benefit from a gentle introduction to our concerns, as well as a great donation for a local library.